Airway management devices comprises devices that are used in the treatment of respiratory diseases that cause airway obstruction in prematurely born babies and infants. 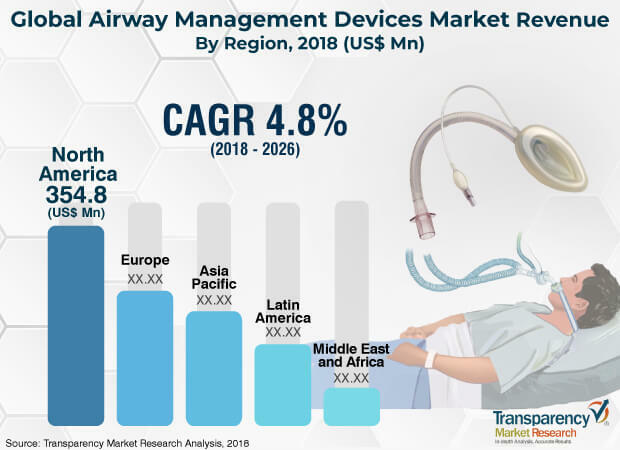 Technical advances, such as rapid innovation in the field of airway monitoring devices, portability, quick and easy usage, and utilization of various anesthetic drugs are key drivers of the airway management devices market. Portability of airway management devices and easy movement of patients have fueled the airway management devices market. Development of various supraglottic airway devices in critical care units and operating rooms in hospitals has benefitted clinicians by introducing more flexibility in treatment, in accordance with changes in patient conditions, thereby leading to a reduction in the cost of drugs. The global airway management devices market was valued at US$ 832.0 Mn in 2017. It is estimated to reach a value of US$ 1,266.0 Mn by 2026, expanding at a CAGR of 4.8% during the forecast period. Rise in prevalence of chronic respiratory diseases, increase in geriatric population, and rise in health care expenditure on airway management devices that are utilized in different medical emergencies are likely to propel the market during the forecast period. Furthermore, rapid innovation and favorable reimbursement policies are driving the global airway management devices market. The global airway management devices market has been segmented based on product type, patient age, end-user, and region. In terms of product type, the market has been classified into supraglottic device, infraglottic device, resuscitators, and laryngoscope. The supraglottic device segment is expected to lead the market during the forecast period. Based on patient age, the airway management devices market has been divided into adult and pediatric. Among these, the adult segment dominates the market due to the high demand for airway management devices in adult and geriatric population. In terms of end-user, the global airway management devices market has been segregated into operating room (OR), intensive care unit (ICU), and others. The OR segment is expected to lead the global market during the forecast period. The OR witnesses high utilization of airway management devices, as they are equipped with latest technology airway management devices to provide immediate and effective clearance of airway obstruction. In terms of region, the global airway management devices market can be split into North America, Europe, Asia Pacific, Latin America, and Middle East & Africa. North America is expected to lead the global market from 2018 to 2026, followed by Europe, owing to rapid technology advancements and rising incidences of respiratory diseases in the region. Asia Pacific is expected to follow North America, in terms of revenue share of the global market, during the forecast period. Moreover, strong research and development activities in the region, promoting the development of new respiratory devices, has contributed to the significant share held by the region in the global airway management devices market. The contribution of revenue from developed countries in Western Europe, such as the U.K., Germany, France, and Italy, is responsible for the prominent share held by Europe in the global market. The airway management devices market in Asia Pacific is expected to expand at a significant pace due to developing healthcare infrastructure and increasing government support for people. Other regions, such as Middle East & Africa and Latin America, are expected to be lucrative markets for airway management devices in the near future, due to the high rate of adoption of advanced medical devices coupled with the rapid expansion of the health care industry in these regions. Leading manufacturers of airway management devices covered in this report include Teleflex Incorporated, VYAIRE, GE Healthcare, Medtronic plc, Koninklijke Philips N.V., Ambu A/S, Smiths Medical, Olympus Corporation, Karl Storz Gmbh & Co. KG, and Medline Industries, Inc. This report on the global airway management devices market analyzes the current and future prospects of the market. The report comprises a comprehensive executive summary, including a market snapshot that provides overall information of various segments. The research is a combination of primary and secondary research. Primary research formed the bulk of our research efforts along with information collected from telephonic interviews and interactions via e-mails. Secondary research involved study of company websites, annual reports, press releases, stock analysis presentations, and various international and national databases. The report provides market value in terms of US$ Mn for each segment for the period from 2016 to 2026, considering the macro and micro environmental factors. Growth rates for each segment within the global airway management devices market have been determined after a thorough analysis of past trends, demographics, future trends, technological developments, and regulatory requirements. A detailed qualitative analysis of factors responsible for driving and restraining the market and future opportunities has been provided in the market overview section. The report also provides insights into the key trends of the airway management devices market. Market value in terms of US$ Mn for the period between 2016 and 2026 along with the compound annual growth rate (CAGR %) from 2018 to 2026 are provided for all the segments, considering 2017 as the base year. The year-on-year growth of the global airway management devices market for each segment is also reflected. Additionally, market-related factors such as increasing prevalence of chronic respiratory disease, rising geriatric population, developing healthcare infrastructure in emerging countries, and historical year-on-year growth have been taken into consideration while estimating the market size. The global airway management devices market has been segmented based on product type, patient age, end-user, and region. In terms of product type, the airway management devices market has been divided into supraglottic device, infraglottic device, resuscitators and laryngoscope. In terms of patient age, the market has been segregated into adult and pediatric. In terms of end-user, the market has been classified into operating room (OR), intensive care unit (ICU), and others. In terms of region, the global airway management devices market has been categorized into North America, Europe, Asia Pacific, Latin America, and Middle East & Africa. Additionally, the regions have been further segmented into major countries in each of the regions. These include the U.S., Canada, the U.K., Germany, France, Italy, Spain, China, Australia & New Zealand, Japan, India, Brazil, GCC, South Africa, and Mexico. The report also profiles major players in the airway management devices market based on various attributes such as company overview, financial overview, SWOT analysis, key business strategies, product portfolio, and recent developments. Key companies profiled in the report include Teleflex Incorporated, VYAIRE, GE Healthcare, Medtronic plc, Koninklijke Philips N.V., Ambu A/S, Smiths Medical, Olympus Corporation, Karl Storz Gmbh & Co. KG, and Medline Industries, Inc.